The Western National Omnibus Company was formed from a number of mergers and acquisitions. One involved the bus operations of the Great Western Railway. Over a number of years until the formation of the National Bus Company in 1969, bus services were operated throughout Devon, Cornwall and other parts of the southwest. Following the privatisation of the NBC, Western National became part of the Badgerline group. In 2003 the First brand was introduced and the company was renamed First Devon & Cornwall. 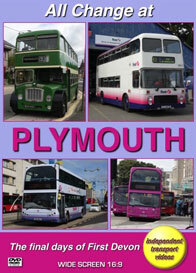 During 2015 it was decided that First would move on from Plymouth and Devon, thus ending a long tradition of bus operations in the area. The final day of operation would be Saturday 5th September 2015. The following day Stagecoach South West would take over with its own network of routes. The other main operator in Plymouth is Go-Ahead Plymouth Citybus, who from this date made some service alterations that would ensure the travelling public in Plymouth could still go to where they wanted to go to! The independent transport videos cameras were on hand to record this historic occasion for you to enjoy. We start on Friday 4th September, the final day of weekday services. Locations include, St Andrews Cross, Royal Parade, Derrys Cross, Bretonside bus station, Union Street and Exeter Street. We see First Devon vehicles in service alongside the interesting fleet of Plymouth Citybus, which includes four day old Enviro 400 double deckers in the new ‘Yellow Flash” branded route livery. We take a ride on First Devon 40002 (S764 RNE), an 8.8m Dennis Dart SLF over the Torpoint Ferry and return to the city centre for more action. We start our final day of coverage at St Andrews Cross before attending Bretonside bus station to see the arrivals of the preserved buses to take up their duties on the ‘Heritage bus services’. Vehicles include four Bristol VRTs, two Bristol Lodekka FLFs a Bristol SUL, some in Tilling green and cream livery and a preserved Dennis Dart in the Western National ‘flags’ livery. A total of seven services were operated over the traditional Western National/First routes – details of which appear on the screen. Action at Bretonside is recorded as well as a ride on service 93 to Yealmpton on board 2019 (824 KDV), a Bristol Lodekka FLF6G, still currently owned by First Kernow (Cornwall). We film both current and heritage buses running along Royal Parade before boarding preserved Bristol VRT, 38847 (LFJ 847W) for a ride over the Torpoint Ferry to HMS Raleigh. On our return journey we stop off and visit Torpoint bus depot. This is the last day that the depot will be in use having been in operation since the 1920s. We journey back to the city centre over the Torpoint Ferry, of which Stagecoach will not be using from the following day. Back at Bretonside bus station we say goodbye to the visiting vehicles marking the end of an era in the southwest. Our cameras return to Plymouth on a dull and dreary 3rd November 2015 to record the scene now that First have left. We see Stagecoach vehicles running in service on their new route network. The only First liveried buses are the ones on the Park & Ride contract, now carrying Stagecoach fleetnames. These will be replaced in early 2016 with a fleet of new Stagecoach vehicles. All Change…!